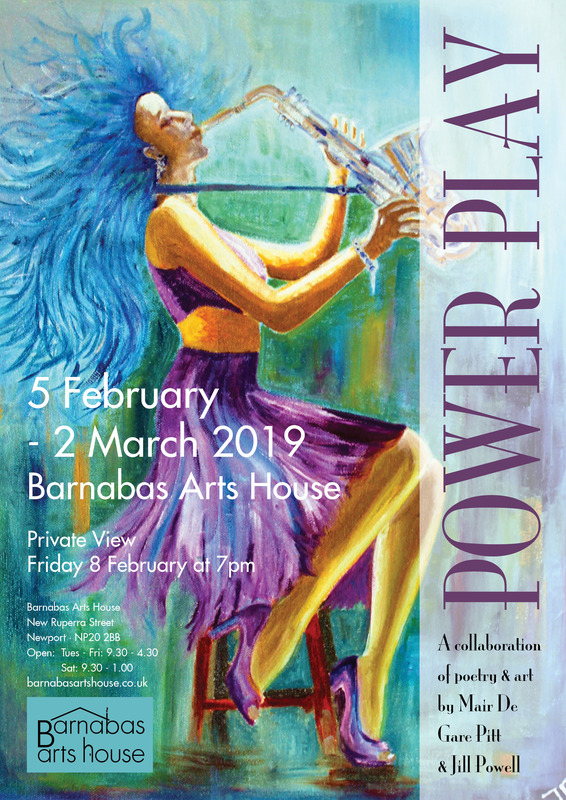 For the first time in the history of the Barnabas Arts House Gallery we have a fusion of literature and fine art in the exhibition ‘Power Play’. The work is a collaboration between renowned writer Mair De Gare Pitt and artist Jill Powell. Each poem is accompanied by an appropriate illustration. The exhibition is available to view from Tuesday 5 February, with the official launch of the book of poetry also entitled ‘Power Play’ at the Private View on Friday 8 February at 7pm. The evening starts at 7pm where the poet & author of ‘Power Play’, Mair De Gare Pitt, will be sharing several poems from this collection of poetry. There will be the opportunity to purchase first edition, signed copies of the book and much of the artwork is offered for sale too. At the Private View there will be the opportunity to meet the artist and poet and find out more about the inspiration for these words and images. The exhibition runs from Tues 5 February until Saturday 2 March. The book will also be available to purchase during opening hours of the exhibition at the price of £8.